Put the boat in at Hickory Hollow right about 7am already 6 trucks in their little lot. Blew the horn for all you OA one basser's as I went over the ER bridge. I had secretly planned to stop by on my way back through but the fish had other plans. Went straight to where I wacked the Walleye last week. Probably 5th cast had a 21"..........then the barrage of boats. One after another and if anyone sees you catch a fish they stop and drop in front or behind you and start fishing. Had it happen about 5-6 times today. Problem is this isn't fast and furious; its slow and a lots of nothing so they don't stick around long. I have yet to see someone drop in on me like that and catch these fish. Frankly if you aren't willing to park on them and beat them to death you may only catch one. Did have a gentlemen show up right after us that knew what he was after and using minnow. I'm not sure how many short Walleyes he caught but it was a bunch. Finished with 3 keepers between 18-21" and probably 7 or so short eyes. Also had 2 smallies. Decided to start working back down toward hickory hollow and wanted to work another channel drop with jerk baits and got into the whites. 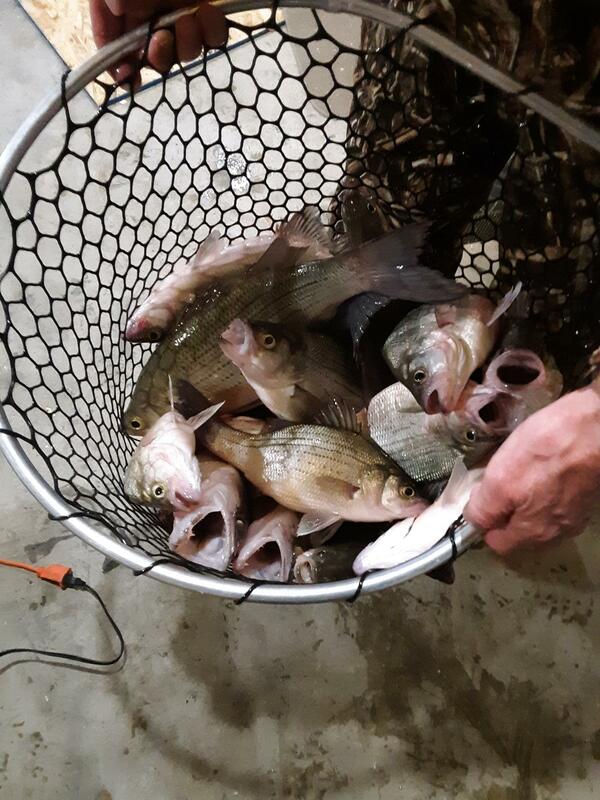 Switch rods and started flinging a rooster tail with the browning air stream rod and ended up with 18 whites. Its certainly not a flyrod but there fun on light tackle. One guy pulled up near by anchored up and pulled out the flyrod and he caught and caught and caught some more. Seemed like every cast from where we were at......I wanna get into a good flyrod bite like that one time. WT was in the 52-54 degree range just about everywhere I looked and there were boats out everywhere. Well done! Don't you love it when a plan and dedication come together? Very nice, and I did hear someone honk as they were crossing the bridge this morning, guess that was you! I heard you also, I was wondering who it could have been. Were you in red top and bottoms? Seen a boat in a spot we wanted in, the boat never left, but many were stacked up on that spot. We decided to leave it alone. Devan, nice jag of fish. Nope not me....I had my brown carhart on all day and jeans. Great report I think that this is the first one that I have ever read about white bass on the Kings although I might have missed a few. I used to fish there a lot years back put in at Hickory Hollow many times and back when it was Achin' Back too. Actually lived in Golden for a while hate to tell you how many years ago that was!